Get things done efficiently and in style with premium access to the best productivity tools out there, now at a once in a lifetime price! Take notes, save content from the Web to read later, tame your tasks and manage your passwords like a pro with our amazing bundle. And with the new addition of Dropbox Pro, store all of your data in the cloud! With the $59.99 Productivity Pack, you’ll get 67% off 1-Year Premium Subscriptions to top tier web services. If you’re already a premium subscriber to any of these services (except Dropbox Pro) – don’t worry, this bundle will allow you to add a full year to the end of your current subscription. Whether you need to take notes at a meeting or lecture, jot down your thoughts for a project, save articles for research from the Web, or create a handy task list, Evernote can do it all across your desktop and mobile devices. With Evernote Premium, you get more room for your notes and files, the ability to annotate PDFs, a simple and beautiful note presentation tool, related content and notes based on what you’re working on, document search and full offline access. Pocket is a great way to read Web content later: save articles from your browser and have them synced to your mobile device to read offline wherever you are, whenever you have time. With Pocket Premium, you can backup articles so they’re available to you forever, and get advanced search features including more search operators and sorting options, and a list of your recent searches for easy retrieval of your favorite content. Wunderlist is an easy to use, yet powerful to-do app that’s great for managing your own tasks and working with others. The app is available on just about every platform you can think of, looks great and has several useful features to make it easy to tackle your tasks. Wunderlist Pro is all about collaboration. Assign tasks to others, attach files of any sizes to them, add unlimited subtasks, and dress up Wunderlist with a wide choice of gorgeous backgrounds. LastPass makes remembering passwords a thing of the past. Save all your passwords for quicker logins across your browser, fill out forms with just a click, and generate secure passwords when you need them in a flash. LastPass Premium adds a bunch of userful features, including unlimited mobile sync, additional multifactor authentication options and priority tech support. Just added to the bundle today, you’ll get 3 months of Dropbox Pro, which give you 1TB of cloud storage. It doesn’t get much simpler than that – as an added bonus on this already amazing bundle, become a Pro for 3 months. This add-on is available to new Dropbox Pro users only. Catch up on global and US news from The New York Times on your browser and mobile device for eight weeks for free! You’ll also get access to exclusive videos and blogs, as well as the TimesMachine Archive to find older content just as it originally appeared. 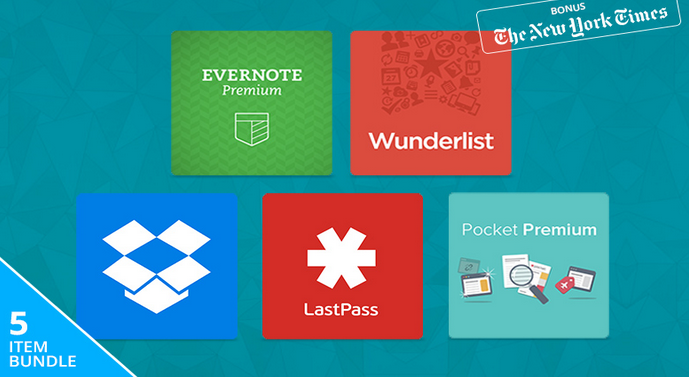 Score 1 year of premium access to these great apps for just under $60 from TNW Deals — that’s a 67% discount!